Archives for 1987 | Laser Pointer Safety - News of aviation-related incidents, arrests, etc. A Soviet naval vessel used to monitor Soviet missile tests “apparently” aimed a laser beam at two U.S. aircraft, causing temporary blindness to a pilot. The incident happened September 30 or October 1, 1987. According to an October 2 1987 Pentagon statement, a U.S. Navy P-3 reconnaissance aircraft was “illuminated by an intense light” from the Soviet ship Chukotka. An Air Force WC-135 intelligence plane also was illuminated. Sen. Malcolm Wallop (R-Wy) initially disclosed the incident. He said “In my opinion, anything that disturbs your vision for 10 minutes damages your vision. The effect was to temporarily blind that co-pilot." According to the Pentagon, they believe the light source was a laser. The Pentagon statement did not speculate on the reason for the illumination of the aircraft. 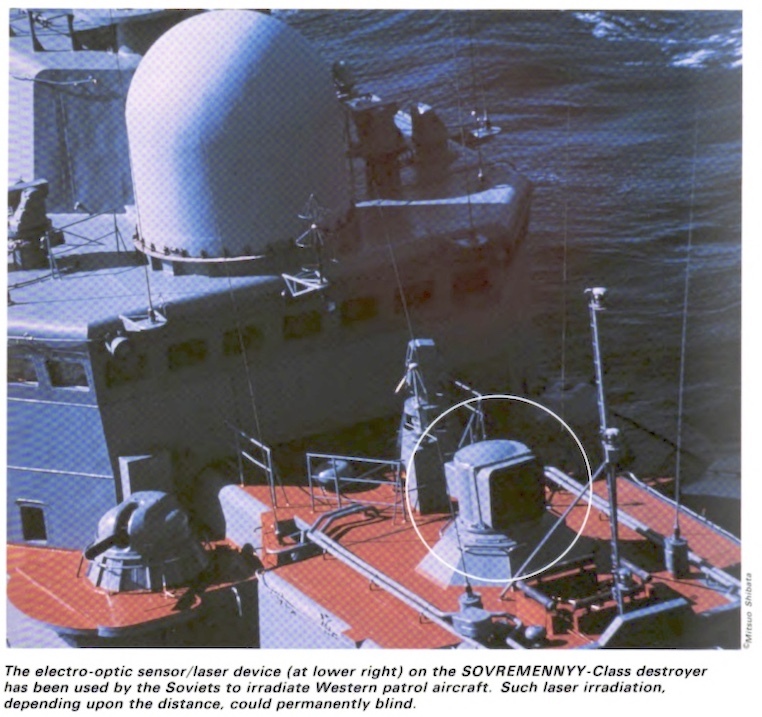 The New York Times referenced one official who said the Soviet ship might have tried to harass or blind the pilots, while a naval consultant said it could be that the laser was used to track missiles and was inadvertently shined at the U.S. aircraft. Such illumination had occurred before, according to the Pentagon statement.